Reeds House #1 is a luxurious, four-story condominium with direct access to trendy Reeds Bay. A cook will prepare two meals for you and your guests each day, there’s several restaurants nearby in Holetown and Speightstown. The condo has two spa pools, and is steps from the beach. And if you rent all 4 bedrooms you’ll love hanging out on the rooftop deck in the loungers and BBQ nook, the views are incredible! 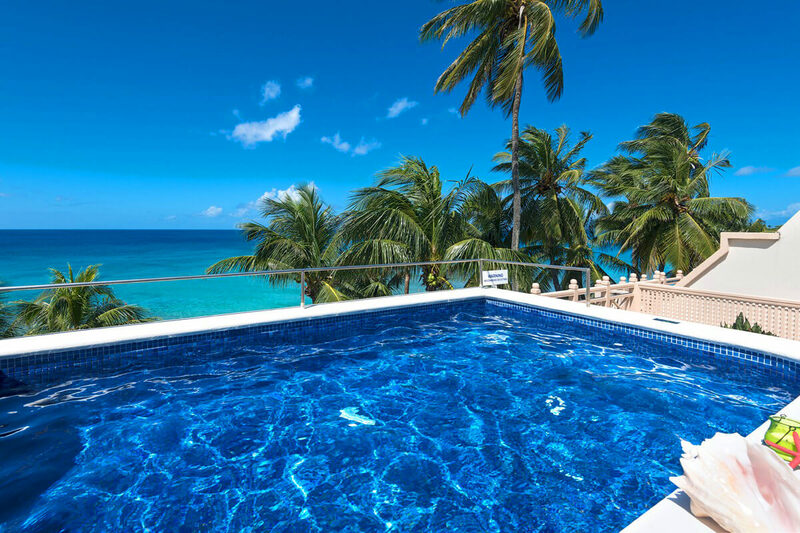 Reeds House is a chic complex on Barbados’ Platinum Coast, with beachfront access and proximity to Holetown and Speightstown. Reeds House #1 takes up four floors of the south wing, and each floor can be accessed from the complex’s main corridors. Reeds Bay has sea turtles, a sheltered swimming area, and snorkeling off the reef. There’s sun loungers for guests to lay out on and an outdoor shower. On the ground floor, the patio has a plunge pool, dining area with BBQ, and a garden path leading to the water. There’s a lounging area next to the plunge pool. The patio leads into the open floor plan kitchen and living area. The living area has cable TV, a DVD player, and lots of seating. The adjacent kitchen has a breakfast bar, basic appliances, an electric kettle, coffeemaker, toaster, and marbled dishes. This level holds the master bedroom, which has a king-sized bed, walk-in closet, patio access, ensuite bathroom with a shower and Jacuzzi tub. A stairwell from the patio leads to the second floor, which holds a private patio, living area, and two bedrooms. The private patio has two loungers and ocean views, and leads into the living room. The living room is open and cozy, with a large screen TV and comfy sofa. The two second level bedrooms each have twin beds, ensuite bathrooms, and closets. A level up, the third floor has a double patio with dining and a window seat on one side, and two ocean-facing chairs on the other. This patio can be accessed from the king suite, which has a kitchen and living area, ensuite bathroom with Jacuzzi tub and shower, and a walk-in closet. The rooftop deck has a spa pool and amazing views. There’s a dining nook with a BBQ and sun loungers, where guests can relax and enjoy their own private view of the beach. We just returned from a 5-night stay in Reeds House #1. We were a group of 8 women celebrating my 50th birthday. What an amazing vacation we had! First, the location of Reeds House is perfect. It’s right on the beach and centrally located between Holetown and Speightstown. Our chef, Sabrina, and housekeeper, Markeisha, were phenomenal. They spoiled us rotten. Sabrina’s Bajan recipes were delicious. Markeisha made sure that the condo was spotlessly clean. Mark works onsite and was very helpful, as well. We loved the proximity to shopping, restaurants, and grocery stores. We often hopped on the “reggae bus” to get where we needed to go. It was quite the experience! We had very nice meals at Lone Star and Tides. Both are in beautiful settings with attentive staff. Barbados is a beautifully lush island with so much to do and see. I look forward to going back in April! Thank you, Shawna, for all your help in putting our trip together. WhereToStay is an excellent company to work with! You were great! Thank you for all of your help in setting up our trip! Everything exceeded our expectations! -This offer can not be combined with other offers and is subject to availability. Good for stays from Jun 1, 2019 to Jun 30, 2019. Must book by May 14, 2019.